This card layout, although basic, is very versatile! Substitute the color scheme and greeting easily to create simple every day cards. Hodgepodge Hardware (Antique Brass) -- Will be retiring in Aug. 2008 and on sale now (25% off)! Cut the 12x12 textured piece of River Rock paper to 10x5. Then score in half to make the 5x5 card - to fold at the top (instead of on the left). Cut 2-1/2 x 5 piece of Chocolate chip paper. Cut 2 x 5 piece of striped designer series paper and adhere to the Chocolate Chip. Wrap ribbon around this piece. Then adhere to card front. Using the larger square punch, punch 3 Chocolate Chip square. Using the large motif from the Baroque Motifs stampset, ink with Chocolate Chip and stamp 3 images on the textured Bashful Blue cardstock. Using the smaller square punch, punch out each image and adhere to the Chocolate Chip squares. 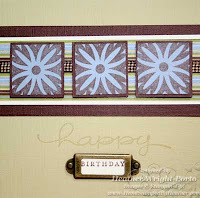 Adhere to card front with Stampin' Dimensionals. Stamp "Happy" from the Happy Everything stampset onto the River Rock textured card front. Stamp "Birthday" from the Happy Everything stampset onto a Very Vanilla scrap piece of paper (using Chocolate Chip ink). Place Hodgepodge Hardware (rectangular frame) over the "Birthday" greeting. Pierce holes on the sides using the 1/16" Circle handheld punch and then place brads through. Then cut out of cardstock (yes, with the hodgepodge hardware already on the cardstock). Then adhere to card front to finish the card. or if you are one of my existing customers.